How do you generate that lightbulb “aha” moment of understanding for your students? 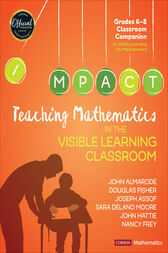 This book helps to answer that question by showing Visible Learning strategies in action in high-impact mathematics classrooms. Walk in the shoes of teachers as they engage in the countless micro-decisions required to balance strategies, tasks, and assessments, demonstrating that it’s not only what works, but when. A decision-making matrix and grade-leveled examples help you leverage the most effective teaching practices at the most effective time to meet the surface, deep, and transfer learning needs of every student.